Just returned from a visit to Sheffield for Off the Shelf, where I got to spend some time at the lovely Poetry Business HQ where Peter and Ann work so hard (surrounded by books on all sides!) Good to read with fellow PB competition winners David Attwooll and Emma Danes alongside Simon Armitage. All that, and secondhand bookshops, vinyl record collectors, and stunning scenery. Bank Street Arts where Peter and Ann have their offices is hosting the Sheffield International Artists Book Prize so we were treated to an exhibition of some beautiful, quirky, imaginative little books. 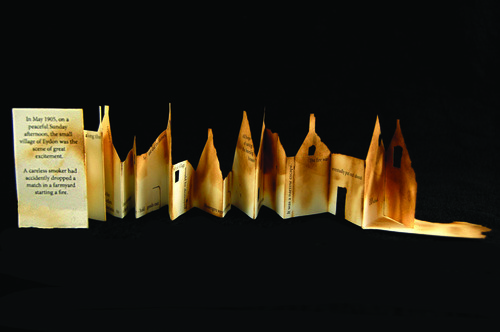 This is The Great Fire of Eydon by Isla Millar (UK Student Prize Winner). Find out more here.